Many indie authors get caught up in “paralysis by analysis” when self-publishing their books, second guessing their every move, thinking ahead to every step in the process, ultimately feeling completely overwhelmed. 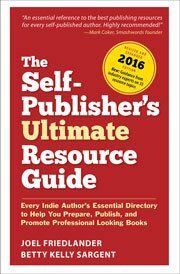 Today, Judy Baker—a branding expert and past president of the Bay Area Independent Publishers Association—explains how to avoid this state of mind so that you can move forward with your self-publishing project. Focus on What Matters Most and Take Action Now. It is my mantra. I used to struggle to keep on track. Most of my life, my brain would churn out an avalanche of ideas, flooding my mind and taking my attention off of what I had already started. New, bright and shiny possibilities would pull me in too many directions. I would be excited at first, then I would suffer indecision and doubt. If only I could stick with the projects I had in progress before running off to do something else…That’s who I used to be, not who I am today. How Did I Go From Distracted To Determined? I attended a workshop with Steven Campbell, author of Making Your Mind Magnificent, Flourishing at Any Age. The “golden nugget” I got from the workshop: it’s possible to re-program your brain to get exactly what you want in life. This is not wishful thinking. It’s actually using the power of the right side of the brain to imagine and create the reality that you want. If you think you can, you can. If you think you can’t, you can’t. The brain can hold two opposite ideas at the same time. It looks for a way to be in balance. This is the power that I have tapped into. I don’t have to know how I’m going to change. I just have to imagine that I have already changed (in the present) and my brain will figure it out. Inside of your brain, the Reticular Activating System filters out the stuff that is not important and locks on to the stuff that is vital. Have you ever noticed when you are shopping for a car that suddenly you will see that particular model and make everywhere. Your brain would never have seen that car so frequently without your locking on to it. Focusing on what matters most changed how I approach my day and where I spend my time. Knowing that I am the creator of my life and my experience in life gives me a lot of power. Specifically identifying what you want is critical to your success. Being vague doesn’t work. Painting a picture with precision is what turns our amazing brain into problem solving machines. The picture is real, has details and my brain can now create the actions I need to take to make it so. There was a time when people believed that repeating an affirmation over, and over, and over was the way to stimulate change. What Steven Campbell revealed in his book and in his workshop, repeating an affirmation countless times actually keeps the affirmation in the analytical left side of the brain and makes it easy to ignore it. It’s when the creative right side of the brain vividly pictures the reality we want that our brain looks for ways to make it so. Our brains work 24/7 and it is crucial that we give ourselves time to rest and digest the information we take in every day. It’s during the time when we are sleeping that the heavy lifting takes place. We sort through our experiences of the day and put information into order. Our brains solve problems while we sleep. Without action, a goal is just a dream. Do you have a big hairy audacious goal? It doesn’t have to be a big action to get you started, you just have to start. After the brainstorming phase, go back and look at your map. See what ideas seem to be related. Put the items from your map into a list for each cluster of related ideas. Pick one of the ideas and do one thing that will move you closer to your goal. Schedule time to take action. I recommend setting a timer for 10 minutes for each phase of your mind mapping exercise. You can do this with a simple yellow pad and a pencil or create a mind map using one of the many software applications designed for this purpose. Scapple (one time fee to download, $14.99, Mac Only) from the same folks who developed Scrivener, it is also primary for writers. MindMap (a free Google Chrome Extension) that you can connect to Google Drive, Box and Dropbox. Freemind (free) works on all platforms, maps can be exported to html, pdf, OpenDocument, svg or png files. Yesterday is gone. Get on with what is here and now. As a cancer survivor, I understand that there are no guarantees. I could be mired in what happened to me. Instead, I am choosing to move forward and embrace life. Focus on what matters most to you and take action now. Judy Baker helps independent authors sell more books. She is a certified Action Plan Marketing Coach, blogger, and speaker. “Marketing is a Conversation” — and she know how to get people talking. Brandvines.com delivers practical book marketing tips. Baker lives in Sonoma with her husband and three chickens, Spot, Buffy and Rosita. Great post! Based on your experience, what matters most to marketing a book? Brian, I’m sure Judy will haver her own input, but from my point of view what matters most in marketing is your understanding of your readers. Thanks for the inspiration, Judy. I’m a big fan of mind mapping, and use it extensively for new projects, preparing presentations, even for blog posts. In fact, the first course I ever gave online was completely built around a fairly huge mind map. The tool I use is Mind Manager from MindJet Software, and I believe it’s the most capable and flexible of all the mind mapping tools, at least the ones I’ve tried (including most of the free ones on your list). Thanks for the mind-mapping recommendation. I wrote my first book last year after two decades in IT. I’m in my mid-40s and I wanted to write a book about zombies. The most important thing to me was carving a niche every day that was “my” time to write. You’d be surprised how fast a book gets written if you spend even a little time on it every day. I had no formal training in writing, but I did read a lot. For me, things got complicated during the editing and publishing stage. I chose to do it all myself, which required a lot of reading and research. Very easy to feel snowed under. Wish I’d seen this post back then. Lots of great inspiration – thank you! One small caveat – the example you gave under Reticular Activating System is actually an example of the Baader-Meinhof Phenomenon, in which something previously unfamiliar to you suddenly seems to appear everywhere. Wonderful post! I really needed this today. 🙂 One small note…Scapple is available for both Mac and Windows. If you’re a cross-platformer like me, you can use both versions to open and edit the same mind map. It’s fantastic! I agree it is easy to get overwhelmed when doing everything by yourself. I appreciate your comment about doing a little writing every day. I am two weeks into a 31-day 500 Words a Day Challenge. I am amazed at how little time it takes me to hit my 500 words. I write without editing on my first pass. I have taken some of my 500 word ideas and turned them into blog posts.